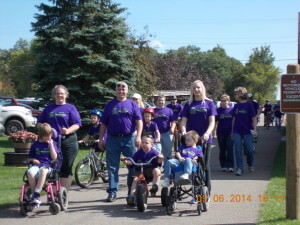 Join us on Saturday, September 8th, for our annual Walk-N-Roll So They Can Ride fundraising event. Walkers, runners, bikers, wheelchairs, strollers all are welcome. Bring your family & friends and join the fun. 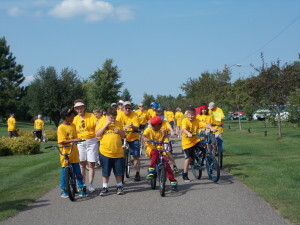 The route will begin and end at the Trailside Center in Pequot Lakes. In addition this year we are combining with the event the 5K Run for the Horseshoes. Walkers and runners will take a 3.2 mile route on a nearby city street and the Paul Bunyan Trail. Bikers and those more ambitious will take a 6 mile route. There will be ALL YOU CAN EAT PANCAKES & SAUSAGE BREAKFAST for Freewill Offering and games at the Trailside Center as well as a raffle. There is a minimum $25 registration fee for all participants ages 9 and older. Registration will begin at 8am and the starting time is 9am. Please complete the online registration form below for each participant and submit with your $25 registration fee. Registering early enables us to better prepare the food quantities and t-shirt numbers. You can create a team of family and friends and compete for one of the many prizes. Print off the Pledge Form to use for collecting your pledges from family and friends. There will be a prize for the most pledges collected. Start taking your pledges today! Download our printable pledge form here. Let’s make this the biggest and best Walk-N-Roll and Run for the Horseshoes ever!! For more information contact Lynn Fairbanks at 218-831-8240. Please complete a form for EACH INDIVIDUAL participating in the event. If the name on your credit card or paypal account you made your payment with does not match your name on this form, please note it here. I am aware that participating in and running a race is a potentially hazardous activity. I understand that the course is over city streets and the Paul Bunyan Trail and it is unknown to organizers what type of condition the streets and the trail are in and what type of debris may be on them. I should not enter and run this race unless I know that I am medically able and properly trained to do so. I agree and abide by any decision of a race official relative to my ability to safely complete the run. In consideration of the acceptance of this entry, I hereby, for myself and my heirs, executors and administrators, waive any and all rights, claims and damages I may have against Mounted Eagles, Inc., Trailside Center, City of Pequot Lakes, sponsors, associated parties and any individuals associated with this event. I grant permission for the free use of my name and image on any broadcast, telecast, social media or print media account of the event. I acknowledge I have read and fully understand my own liability and do accept the conditions. I understand that all entries are final with no refunds. The official race director reserves the right in any event of emergency or local or natural disaster to cancel the race or change the day or time to a later day and that in the event of cancellation or change there will be no refund of fees. If you are under 18 years you must have the signature of your legal guardian to participate in this event. This article was posted in Events. Bookmark the permalink. Follow comments with the RSS feed for this post.Post a Comment or leave a trackback: Trackback URL.